From left to right: Nate Johnson, Jeremy Viers, and Nick Koren pose next to a John Deere engine they’ve used to practice with in their class in the power sports program at the Delaware Area Career Center. A team of Delaware Area Career Center students recently placed second at a FFA state competition. Competing in power sports, which deals with engines smaller than car engines, the runner-up team from Delaware County consisted of Jeremy Viers, an Olentangy High School senior; Nick Koren, a Westerville Central senior; and Nate Johnson, a Buckeye Valley senior. Koren said the competition dealt with everything from putting an engine together, engine measurements, replacing parts, electrical issues, part identification and tool knowledge. He added the competition also involved troubleshooting and fixing an engine with one problem in under 10 minutes. The team said there was also a 20-question quiz that it scored a 17 out of 20 on. The team added it was proud because no one was able to score perfect, and the team didn’t hear of anyone scoring higher than 18. Koren said the students competed individually, and are also scored as a team. The students said the knowledge they accrued in the power sports program at the DACC was essential for the competition. “Practice, practice, practice makes perfect, for sure.” Koren said. Johnson said they were competing against FFA students in the same categories who don’t attend technical classes like those offered by the DACC, which he said was a huge advantage. “We competed against regular high schools, and they don’t get hands-on experience like we do,” Johnson said. Koren and Johnson, who both competed in the competition last year and placed 14th, said they weren’t really nervous this time because they had done it before. The team added it was thrilled with its second-place finish. Additionally, Koren took seventh place individually, and Johnson placed 14th. Viers said he’s already applied for a job as a diesel mechanic because of the skills he gained in the class, and Johnson said he’s planning to move to Florida to become a diesel mechanic after he graduates. Koren said he will be attending the University of Northwestern Ohio for a few years before becoming a diesel mechanic. 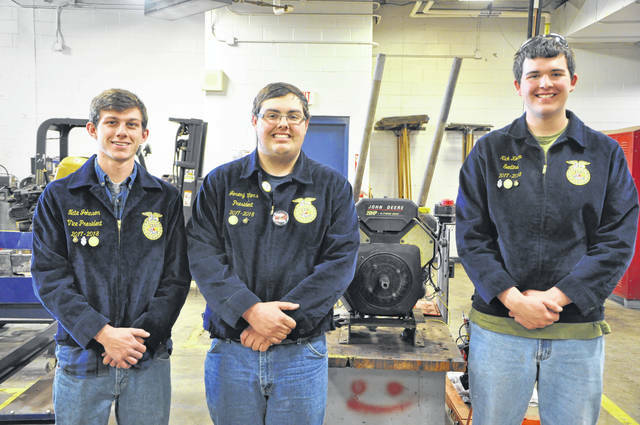 https://www.delgazette.com/wp-content/uploads/sites/40/2018/04/web1_DSC_0105.jpgFrom left to right: Nate Johnson, Jeremy Viers, and Nick Koren pose next to a John Deere engine they’ve used to practice with in their class in the power sports program at the Delaware Area Career Center.